The rocks are monumental sculptures, painted with lichens in green, orange and black. The beavers have crafted jewels to reflect the sky. There are the twisty groves of aspens, forests of ramrod straight pines. It’s rare not to see deer and antelope. If you’ve wandered around much, enjoying the wonderful, you have probably stumbled across some of the weird. After all it was a "Target and Maneuver Range" for more than 50 years. The Army, Air Force, ROTC and National Guard guys all had some fun blowing things up and shooting things down. There once was a headquarters with 18 buildings. And before that there was the town of Tie City. Telegraph poles were taken even earlier for a telegraph line along the Overland Trail. A highway man lived up on Brown’s Landing, robbing travelers. Uranium mines were blasted from the rock. There was a Civilian Conservation Corps camp. The Happy Jack Ski area operated for many years and there was a lodge where the summit rest area is now. Frankly, there is a lot of weird stuff to be found. Here’s a little "treasure" hunt of some odd places I‘ve run across or discovered by searching old records and scouring the ground. Interested? See how many you can find. A GPS would get you there the fastest. But the UTM coordinates (NAD27) can be used with a USGS topo quad. Or just follow the directions. You will need a good map. By giving you these locations, I’m trusting these sites to you. Let’s leave them be so we can take our kids and grandkids there for years to come. Please don’t kick a stick or chock a rock. Besides, if you disrupt any artifacts, the mummy’s curse will follow you for the rest of your life. The Forest Service archeologist asked me to remind you that the use of metal detectors at these sites is illegal. It would also be stupid. One trowel jabbed into a live shell could just blow you up. So, whether you go by truck, ATV, mountain bike or by foot, have fun. Let me know what you discover. If you find any other weird and wonderful stuff put a comment at the bottom. 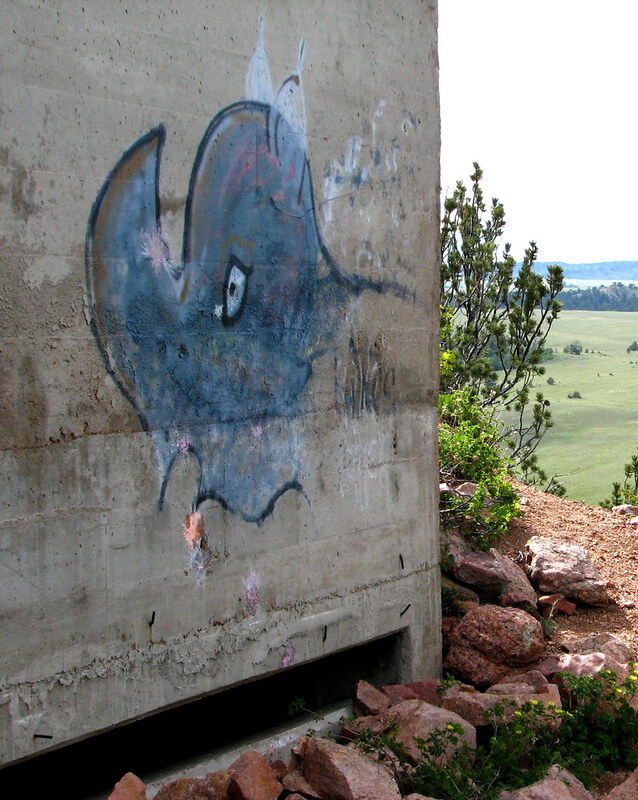 Merritt Hill concrete observation bunker. 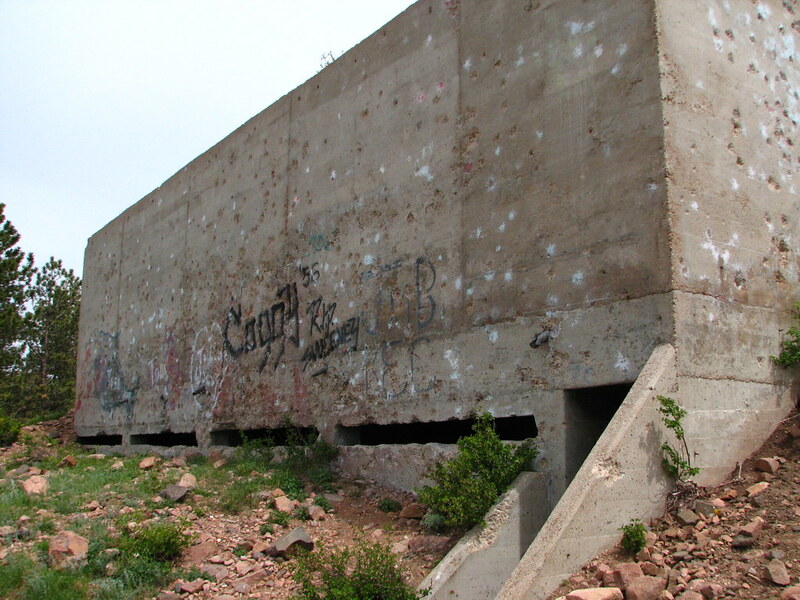 Bisbee Hill concrete observation bunker. Two collapsed bunkers with log roofs, connected by trench work. 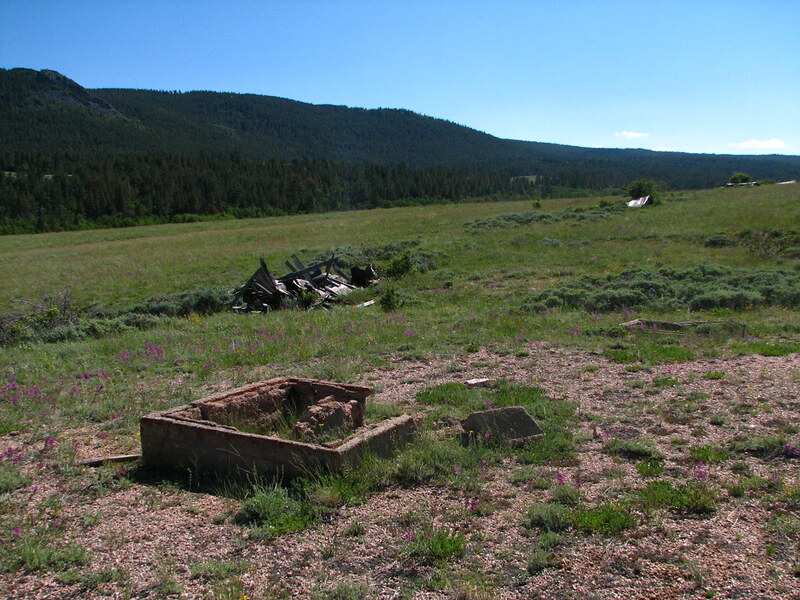 A dozen or so old rifle pits or shelters from a time prior to WWII. Graves dating from long ago. Buried here is the body of a young boy struck by lightning nearby as he rode to Laramie on the Cheyenne Pass Road and the infant daughter of local homesteader, Ben Black. It looks like there is at least one more grave. FS 701 north, Left on 712. Right on 702. Right on 714. Off the road in a copse of trees to the right shortly before 713. 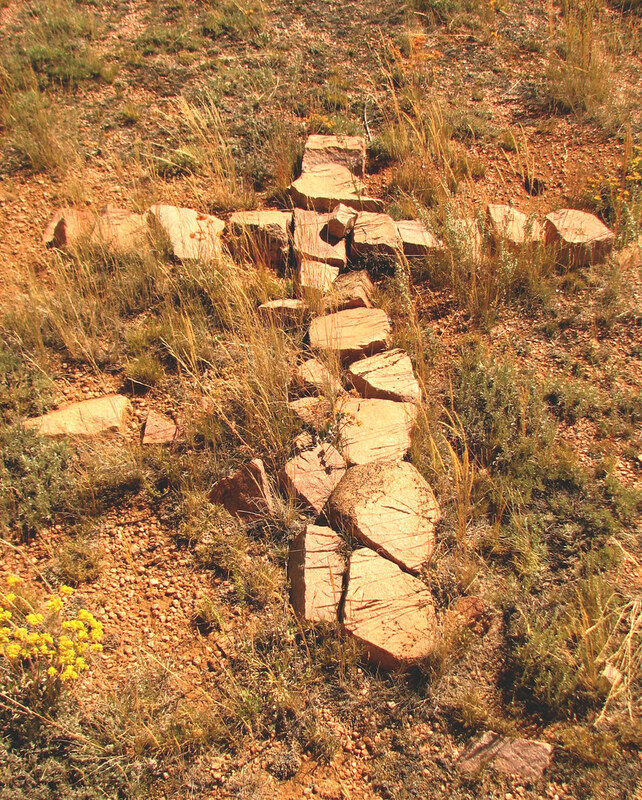 The rock cross near the road points to the graves. (UTM 0472410 / 4569464). 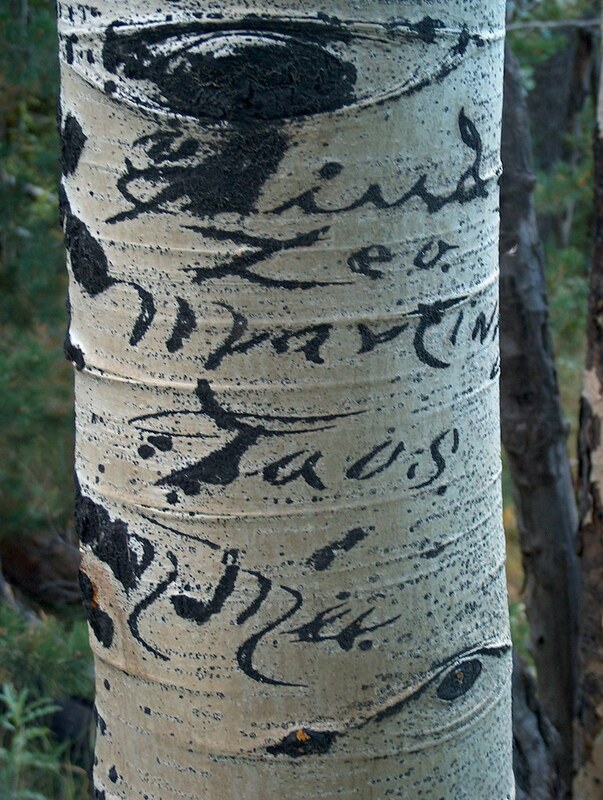 Laycock Spring and aspens carved by Spanish herders in a graceful script. Vedauwoo Glen performance stage steps. 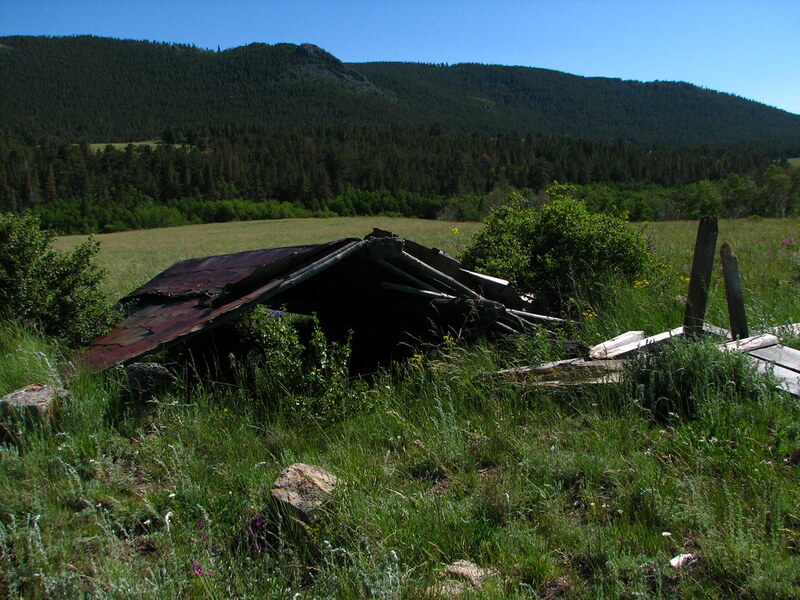 This entry was posted in Wyoming and tagged Bisbee Hill, bunker, Cheyenne, GPS, graves, Happy Jack Ski area, Laycock Spring, Merritt Hill, Pole Mountain, rifle pit, UTM Coordinates, Veduawoo. You missed one of the more interesting things in the Pole Mountain area. The concrete box that contained a seismograph for monitoring the Russian nuclear bomb tests in the 1950’s. It was one of three locations in SE Wyoming for this purpose. It is the Twin Peaks area and it has been years since I was there. Even the Forest Service personnel I talked to did not know about its existence. The only reason I knew about it was through our neighbor in Laramie who was the Officer in Charge of the three sites. I’ll have to check my maps to get a location for you. Now that is truly weird, and fascinating. Anyone know where this is? I didn’t see any mention of the Ames Monument (pyramids) or the Lincoln’s bust memorial. I found those to be quite interesting as a kid growing up in Laramie. They’ll be included in the next installment. Someone has asked me about an old bunker that was off the Vedauwoo exit. Does anyone know about a bunker in that area? I grew up in Cheyenne and went to school at U of W in Laramie. I’ve been living in Arkansas for the last 14 years now but Pole Mountain and Vedauwoo is my old stomping grounds. We used to camp out in the area of Reynolds Hill and the old Military Reservation and I remember, back in the early ’70 we ran across the ruins you have photographed. I wasn’t into taking many pictures then and I lost track of these old ruins as the years went by. I remember, 20 years later in the early ’90s, trying to find those old observation bunkers time and time again but to no avail. (We figured they were machine gun emplacements.) I concluded they were demolished but I see you have re-discovered them for me. Actually I think it is great they are so out-of-the-way. Help! I went out to locate these with a GPS and had no success. One leads to a place just south of Happy Jack. There is one unusual thing nearby, the fence post was painted yellow then repainted white while all other posts are unpainted. The other is a bit remote, a 1/3 mile walk from the nearest four wheel drive road. Couldn’t find anything. My brother and I explored Pole Mountain from 1966 to 70’s college days at U.W. One interesting site is shown as “Artillery Spring” on the older maps. I have a photo of it when it was neatly rocked in with a nice outlet pipe. I haven’t been back for years,but hope to again pretty soon! P.S. Hi to Jim Arehart above, I was in East High class of ’69 in Cheyenne. Stay tuned for the next installment. I found this last fall, tromping through the brush. The spring flows nicely. Very interesting information you have provided. I just moved to the area and discovered the beautiful Pole Mountains today, Hiked for 3 hours over at Curt Gowdy. Noticed trailheads off 210 and want to do some exploring. Can you recommend somewhere to acquire trail maps for the area? Hi Steve – Glad you’re enjoying the area. For maps the place to begin is definitely the Forest Service’s Medicine Bow National Forest Map. It covers the wonderful and bewildering network of roads in Pole Mountain as well as the Snowy Range and Sierra Madres. You can buy one from the Forest Service in Laramie by calling (307) 745-2300. Ask them to mail you the free pamphlet maps on Turtle Rock, Headquarters Trail and the cross country ski trails (which can also be hiked). You may want more detail. For that the only choice is the two USGS maps, Sherman Mountains East Quadrangle and Sherman Mountains West Quadrangle. It’s probably easiest to get them from the internet at http://topomaps.usgs.gov/ Hit the finding and ordering USGS maps button. Sadly some of the newer trails on not on these. Marc Smith has a book trail guide, Hiking Wyoming’s Medicine Bow National Forest, which covers Pole Mountain as well as the rest of the forest. It’s readily available in Cheyenne and Laramie book stores. 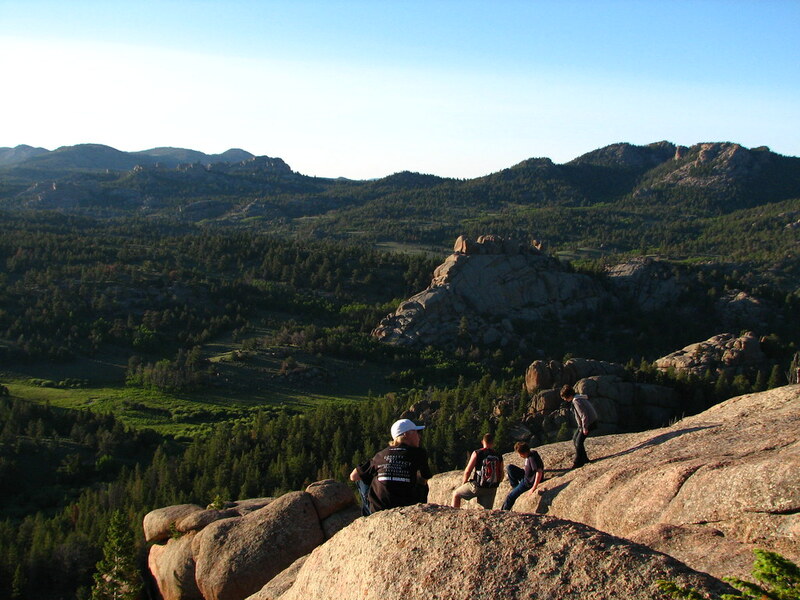 For Curt Gowdy State Park, they have a trail map that is downloadable at http://wyoparks.state.wy.us/Site/SiteInfo.asp?siteID=4 Click on “trails brochure”. I think they will also mail you one or they may be available when you pay your entrance fee at the park gate. This is a cool site! I like these kinds of things. Im at Wyotech right now (bad connotation), and enjoy driving up in these hills, and taking the motorcycle out for a ride in these remote regions. I was driving around up on HJ road about a week ago, and saw what I assume is the Merritt Hill bunker form HJ road. I braved the snow and wheeled myself up there and was pleasantly surprised to find this bunker. When the snow melts, and for the 1 month of summer here in Laramie, im going to do some more exploring, get a cheap GPS and try to find the rest of these places. Or learn how to use a map. Rodger, Thanks for the site. I’ve been hiking Curt Gowdy all summer (my goal to hike every trail before school starts), but now you have given me so many more reasons to hike Medican Bow NF. I hike for exercise and to be outdoors. When I have things to explore, goals to get to I do so much better at getting out a couple of times every week. Thanks for all the new goals. I look forward to more posts about the area. BTW I live just a short distance from Woodhouse and you’ve given me more reasons to explore the area further! Looks like they will be great falls hikes as there is not much shade. Enjoyed your presentation at the Wyoming State Museum tonight. One of your slides showed a horseback rider with an arrow pointing to a movie camera location. There was a 1936 movie called The Plainsman with some scenes filmed at Pole Mountain,Wyoming. I found this on the movie reference website http://www.imdb.com , and found a copy on DVD. Look at the “filming locations” link at the bottom of the IMDB movie page. 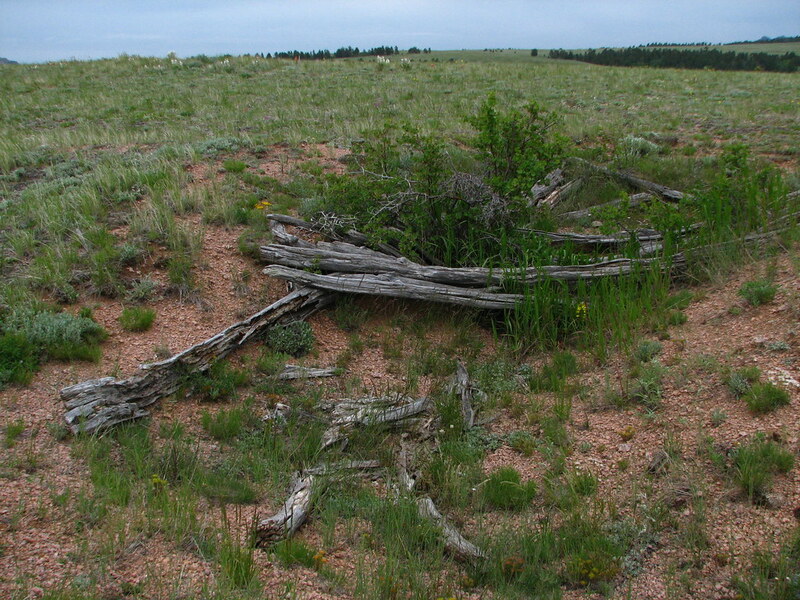 “The cavalry sequences were shot with members of the Wyoming National Guard. Two guardsmen were badly hurt during filming of a charge scene.” – That explains why this photo was at the WY National Guard Museum. Roger do you use the UW Library for research on Pole Mountain? Thanks for your efforts to bring attention to the history of the area and encourage respectful exploring. where I found reference to the Edison movie. This 12 minute silent movie is available in a collection on DVD through Amazon,which I will probably purchase for fun. More amazement. Enjoyed watching the youtube snippet. I’d like to see more to figure out just where they did that charge. Just what was it you found the section in? I saw that it was included as an extra in some versions of the 1968 “Charge of the Light Brigade” – Region 2 DVD release but couldn’t find that one for sale. If you spell it nickelodian, it won’t get you to the DVD. Interestingly this DVD has a nice package cover, featuring a movie poster of the Charge of the Light Brigade. Hope to get it pretty soon. Lastly Wikipedia has some information on the 1912 movie. I think I might have found the artilary spring today. I was hiking up the side of pole mountain and found an old iron pipe line. I followed it to where it ended into what was once some kind of a stone and log building? I hiked up to the old reservoir and took some photos this week. It is very impressive. If my printer cooperates I will make some copies and send to your office address. Feel free to scan and post them if you wish. Google Earth has been a great help in findind these places. It is really easy to find, take Pilot Peak Road (the one across from Tie City Trailhead) and take the first right on a service road. The arrow is at the top of the hill behind the brick building. We found 4 green metal things just off the first Blair Wallis road. There is cables inside too in the bottom. Bullet holes on outside. They are in the ground. 3 by 5 foot deep. Anyone know what they are????? 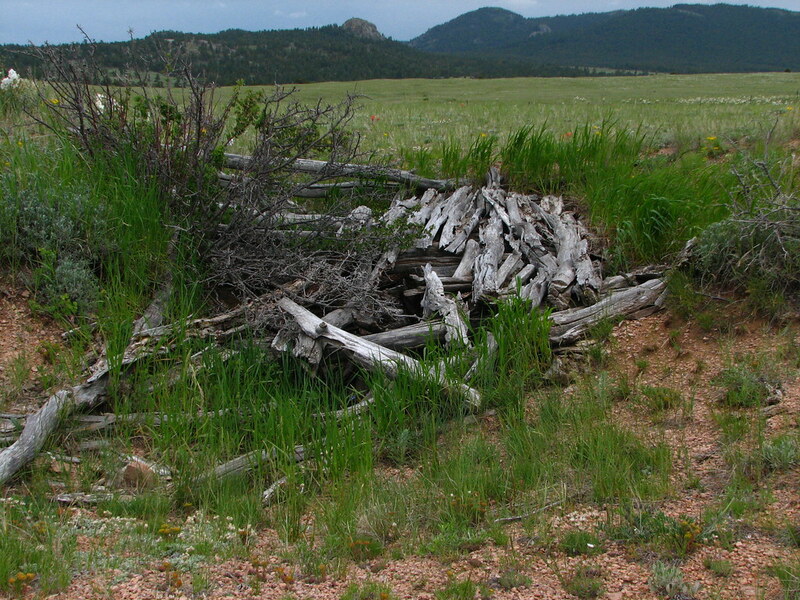 Many years ago I used to hike all over in this section of Medicine Bow. Knew the place VERY well. There is a large cement cistern on a small knob hill located northwest of the military headquarters, on the opposite side of the Blair Wallis road from the headquarters, that supplied water to the headquarters. It used to have a wooden roof over it that has long since collapsed. On the top of one of the four cement walls that make up the cistern, someone wrote the unit’s name in the cement before it dried. The unit’s name is the 10th Mountain and the date, I believe, was sometime during 1910. Found a fired 75mm projectile on the south side of Happy Jack Rd. 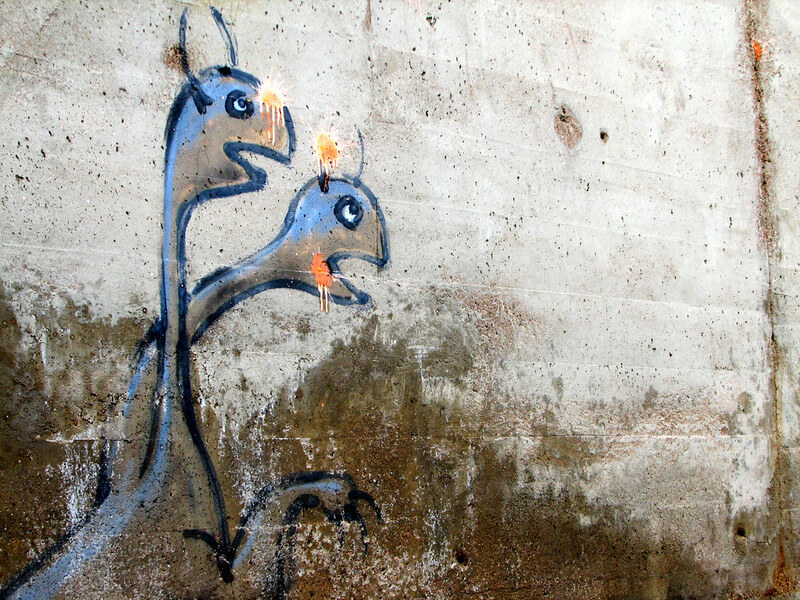 It was far off the beaten path near Headquarters Rd. The projectile was intact, minus the fuse assembly. East of the military headquarters in a small grove of small trees is a large stone / cement “fireplace” which is known as the “National Incinerator” on one of the very old maps (1938 ?) that I have of the area. There is a large trash pit nearby that was bulldozed over but has eroded in places where you can find the old screw top beer cans that resemble brake fluid cans. There are pieces of the traditional white china with blue stripes that the military of the time was famous for having in their mess halls. If your observant as you wander around in the area, you’ll notice cut off telegraph poles forming straight lines between former emplacements / structures in various areas throughout the former Pole Mountain Military Reservation. Some of these former comm lines lead to other interesting finds. On the north side of Happy Jack Rd. there is a grave / monument of some sort that could be for a mascot of a military unit. It’s fairly large, I’d say the square of logs that surrounds the small, short cement obelisk is about 10′ x 10′. The obelisk has a small round disk (4″ to 6″ in diameter) that has an embossed pyramid shape on it. Below this disk, there is some glass jewelry that was embedded in cement of the obelisk when it was still wet. I did not see any writing anywhere on this monument. Your comment and observations are very interesting. I’ve been to all of the things you have pointed out except for the obelisk. I’ll be on the look out for it. Any idea where along Happy Jack? I’m hesitant to post your comment on the site. After I wrote one of the articles someone heavily vandalized the rife pits, stripping off the metal roofing and carting it away. What had been there for probably more than 70 years is now gone. I hope that my writing didn’t have anything to do with it but then again it might have. So now I’m siding with the archeologists who generally recommend keeping things quite until they can be preserved in some way. Thanks for taking the time to write and now giving me something new to search for. Roger, that is indeed sad about the vandalism of the rifle pits. I won’t betray the location of the obelisk as it appeared to me to be more of a grave site than a monument. I also found some remnants of a structure on the south side of Happy Jack that are not listed on your site. There was a wooden structure of some sort that had a shallow rock / cement foundation (no basement) at this site. The structure’s cement steps were still upright but parts of the foundation were broken. I love to explore these old sites. I was fortunate enough to have gone TDY to Cold Bay, Alaska before the massive WWII base (Ft. Randall) was erased by a environmental clean-up operation (EPA?). Spread out across the tundra were dozens of large Quonset huts. All of the Quonset huts were in pits which sheltered all but the top 1/4 to 1/3 of the hut from the fierce winter winds. It was quite a weird feeling walking into these old WWII Quonset huts and seeing something like, “Thomas Hartwig 11 November 43” written on the arched walls of the hut. 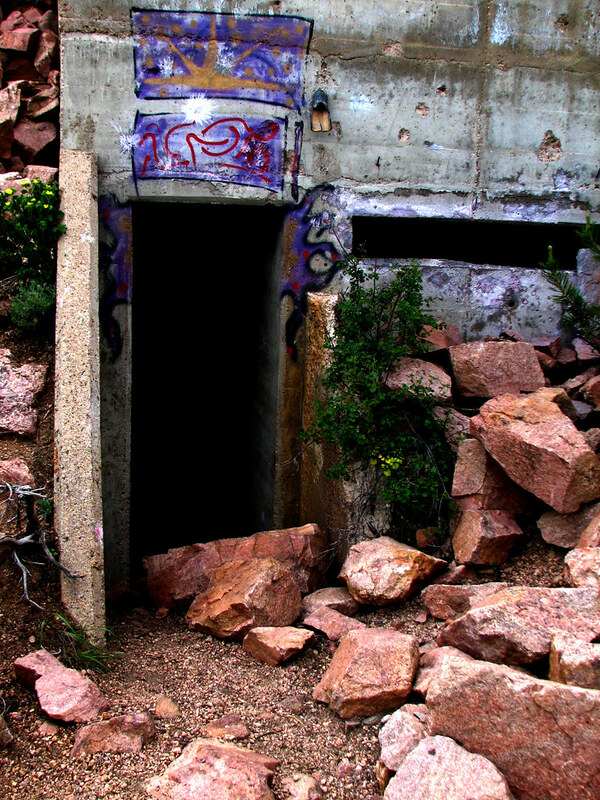 I ran across a large stone lined pit out near the bunker on Bisbee Hill. There is some historic glass fragments in it. Anyone ever seen it before? My thought is that it could’ve been some sort of burn pit for the military. I found an old cistern on 701d. Do you know anything about one in that area? Yes. On old maps the place is listed as the caretaker’s house, being the person who looked after the military headquarters buildings. Up on the hill above the cattle gate you can see a level place where the house once stood. Also, down at the road, are two sets of decaying concrete steps that led into the barns. I have wondered if the house was originally a homestead that was not torn down when the military expanded the reserve. Anyone know more about this? Thanks! I guess the name Caretaker’s. Road should have given me a clue..
No, it is 7 /10 of a mile down 701d, past where the gate crosses the road. It is on the east side of the road and yes, I think you could see it from 701d. I will go back and get some exact coordinates. I will be sure to check it out. Around 1900 the forest reserve was much smaller. Homesteads were established around the edges of it. Then F.E. Warren was instrumental in getting the reserve enlarged by buying out those homesteaders. (He then got the rights to graze his sheep on the newly expanded reserve!) I wonder if what you have found is the remains of one of those homesteads. It would be fascinating to see if the Albany County Clerk has maps and deeds that indicate who had homesteaded and where their homes were. 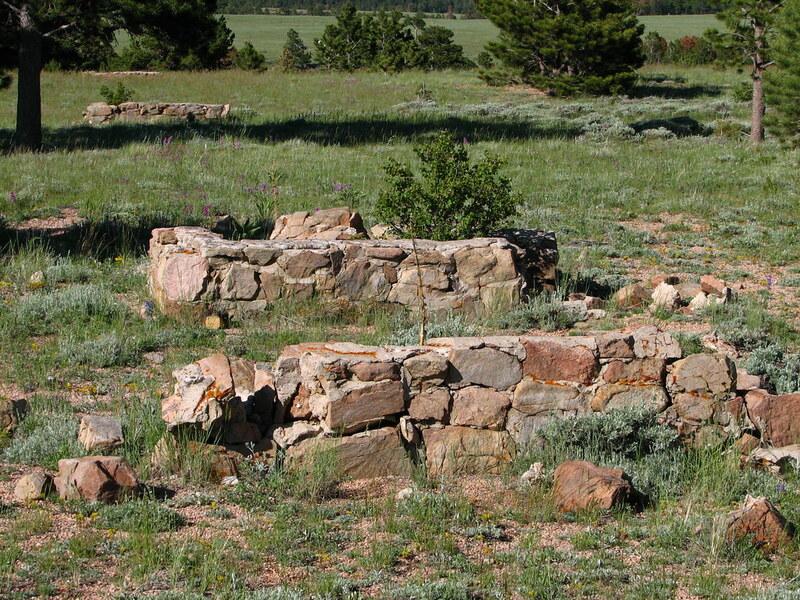 One of the homestead sites you could visit is called the Lattas Ranch on South Fork Middle Crow Creek. It is a beautiful place to hike. Take the Vedauwoo exit then instead of going into the fee area take FS 700 to 700C. Turn right on 700C and follow it until it makes a 90 degree turn to the left to follow the creek. Park there and walk due south, crossing the creek. There are two leveled sites. An old well is there with stuff thrown in including the broken remains of an old wood stove. I love hiking upstream along the creek. The rock formations on the north are beautiful. Today I visited the “cistern” you discovered. I think it is a well blasted out of the rock but one that doesn’t produce enough water to be useful, not flowing enough to reach the outlet hole. It is certainly not old enough to match my theory of a homestead site but probably created to water cattle. Thanks for the info! That makes total sense. Thanks for the directions to the Lattas home stead. I enjoyed finding it. 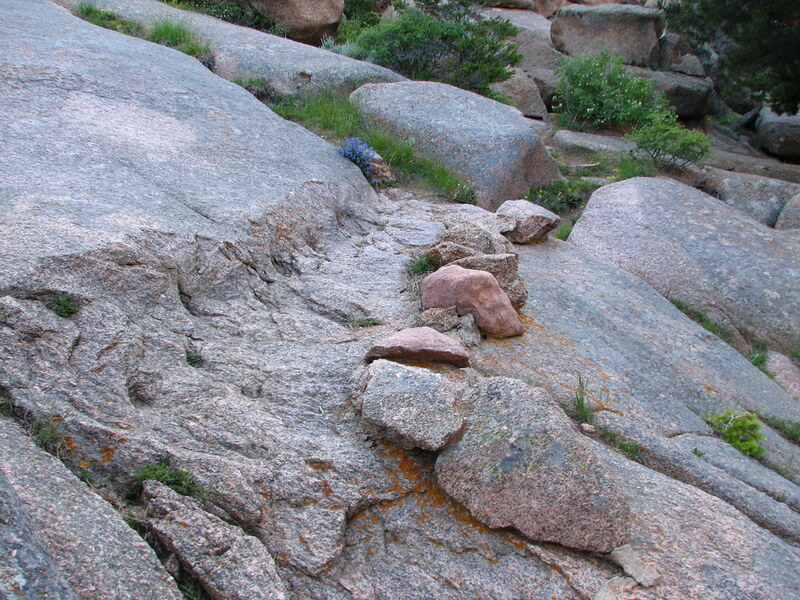 I had hiked several of the rocky creeks off of 700 but not that one. Do you happen to know about LCCC walking trails south of gowdy? There is an old amphitheatre and apparently a waterfall. To get there, we drove past Crystal reservoir of Curt Gowdy and maybe one mile up the hill parked our car to begin the walk. The area was really overgrown and looked abandoned. I finally made us turn around because I got nervous. Wondering if anyone can confirm there is a waterfall and worth going to? 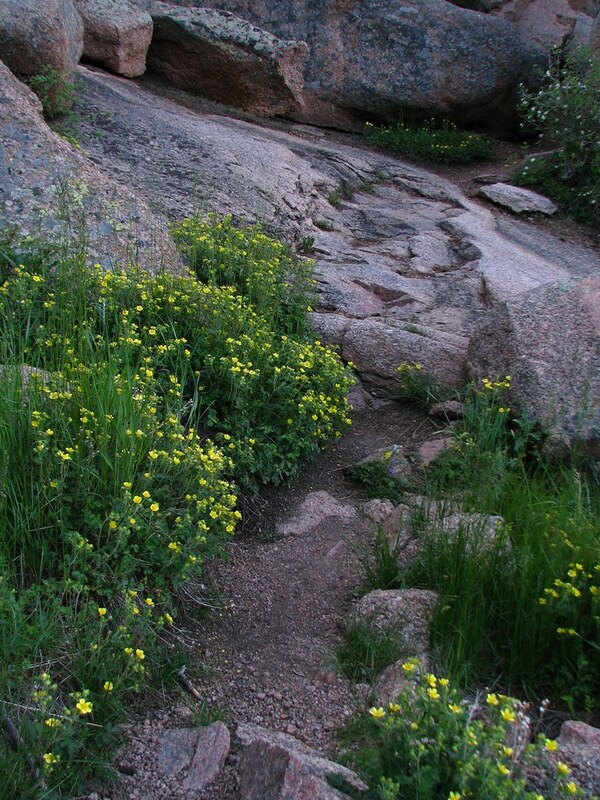 Perhaps it’s a back way to the hidden waterfall at Curt Gowdy? Looking at the Laramie County Assessor’s map online I was able to locate the parcel. It is on Crystal Lake Road. From Happy Jack take the road to Crystal. Don’t turn in to the park but continue straight somewhere between two and three miles. Pass Pine Grove Estates subdivision and the property is on the right (north) side. It is 238.29 acres. It adjoins an equally sized parcel that belongs to Laramie County School District #1 which continues to the north of the Pine Grove area. But warning! Just because it belongs to LCCC and LCSD #1 doesn’t mean we have public access. I believe this is a somewhat developed camp area that the school district uses for special events. Last year they did a revolutionary war re-enactment there. It won’t go to the area behind Hidden Falls. I was up in the Pole Mountain area over the weekend and used your article as a checklist of things to find up there. I found several of the places listed here. The one that intrigued me the most was the graves that were along FR 14 near where it intersects with FR 13. DO you ave any additional information on them? Approx dates anything like that? I would appreciate any additional information that you can provide. That out of the way grave site is very moving to me as well. There are two books, both are in the libraries in Cheyenne and Laramie. If you are in Cheyenne the first book is in the Genealogy section on the 3rd floor and is list of Albany County country and private cemeteries and lists all who is buried in each. Volunteers spent a lot of time on this compilation and there is fascinating detail on this particular one. The librarian will find it for you. Let me know what you think after reading them. I didn’t know about the first book when I wrote the articles. I really should update them. 1. Infant daughter of Ben Black, homesteader, died 1889. 2. 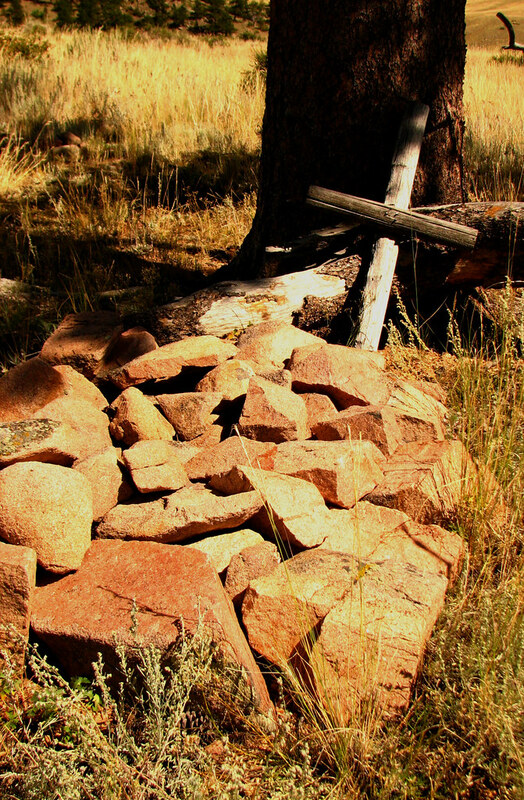 Adele Davis, died 1856 or 1858 while traveling the Lodgepole Trail. Marked by sandstone headstone. 3. Rollo Patterson, killed by lightening, from Oklahoma. 6 & 7. Two children of William Owens, also typhoid, after 1892. 8 & 9. Two children of John Pulcher, homesteader from Germany, also typhoid, after 1892. One may have been named Lizzie. All three homesteaders sold to the Pole Mountain Reserve.